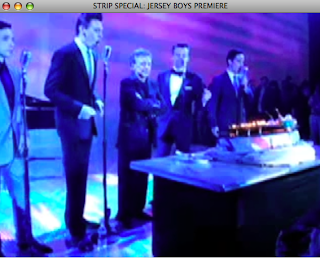 Jean Scott, whose excellent blog on saving money in Vegas is part of the Las Vegas Advisor lineup, reported today she was at last night's "Jersey Boys" performance at Palazzo and saw Erich Bergen, who plays Bob Gaudio, slip and fall. They took a brief intermission and he was replaced. "Yes, Erich did slip and fall last night but he's doing just fine (I spoke to him myself) and we expect him back in the show very shortly, if not tonight." Here's hoping he mends well and returns quickly. But if you're really, really missing him, check out his website or listen to this week's podcast interview with him and Gaudio, whom he plays in the show, by clicking here. Sorry everyone. 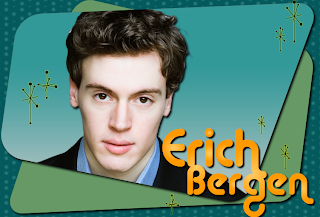 I screwed up the audio on the file for our Erich Bergen-Bob Gaudio program that I put out yesterday. It's fixed now. Click here to listen, right-click here to download it. The links everywhere else have been corrected, too. 10 a.m.: Dr. Jane Brunt, feline vet and coordinator of the CATalyst Summit. 10:30 a.m.: Candance Godfrey, president of the National Association of Professional Petsitters. 11 a.m.: Nilsa Leal, the woman who has had Steve's cat Amishew since the mid-1990s. 11:30 a.m.: North Las Vegas Councilwoman Stephanie Smith on mandatory spay/neuter laws. I wrote this. I even shot some of the pictures. It just came out. It's a really cool, compact little pocket-sized guide with fold-out maps of Las Vegas and its environs (including the Grand Canyon) and provides lots and lots of travel advice. It's also only $10. I'll be adding autographed copies to the prize list for "The Strip" trivia questions. I don't receive royalties -- I did receive a significant advance -- so I don't care where you buy it, although I found it available online here and here. But I'm quite pleased with how it turned out. This week's Las Vegas Weekly column is now online, a look at Frankie Valli's surprise resurgence in Vegas and his explanation about why he left his Luxor contract unceremoniously in 2005. It is hard to believe now, especially after the weekend that just was, that only a few years ago Frankie Valli walked out during a three-week contract at the Luxor and was declared by at least one entertainment writer to have essentially ended his association with Las Vegas once and for all. Hard, that is, because on Saturday the town stood up and cheered as the pipsqueak Italian from New Jersey with the priceless falsetto blew out candles at one of the city’s most elaborate and expensive birthday parties in recent memory. Move over, Paris and Nicole. The nightclubs, for whatever bizarre reason, may pay you to stand and wave on the anniversaries of your unfortunate arrivals, but would anyone stage a multimillion-dollar Broadway musical based on your life story and then have a major resort-casino time the premiere of it on the Las Vegas Strip just to honor you? For Valli, there was no question that the moment was immensely gratifying and somewhat unique for Las Vegas. Sinatra, Rickles and Bennett never fell out of favor in such a way as Frankie Valli and The Four Seasons seemed to and, thus, never had quite this sort of a spectacular comeback as is seen with the triumphant debut of Jersey Boys at the Palazzo. Perhaps, but the wonderful Jersey Boys not only returns The Four Seasons to the forefront of the pop-culture scene but also restores our faith in the future of musical theater in Las Vegas. If last week’s column pointed out how Steve Wynn must be driving convention-travel innovator Sheldon Adelson bananas by planning a huge new expo center, this week it must be noted that Wynn must be utterly depressed that his vision for great Broadway theater on the Strip has been realized not by his now-failed picks Avenue Q and Spamalot but by arch-nemesis Adelson’s knockout versions of Phantom and Jersey Boys. Hey all, this week's show, featuring interviews with Four Seasons songwriter Bob Gaudio (right) and "Jersey Boys" actor Erich Bergen (left) is now online! Click here to hear it or right-click here to download it and listen to it later. Or subscribe via iTunes here or via Zune here. Also, if you're in town, check out KVBC Channel 3 tomorrow morning at 5 and 6 (or set a DVR!) to catch me commenting on the new Cher show. I'll also be on Nevada Week in Review on Channel 10 at 7:30 p.m. discussing the week's news. They replay that throughout the weekend. Next week: Frankie Valli. And a new trivia question and poll. So you've got another four days to answer the trivia quiz after all. Perez Hilton to Norm: You're DEAD! I've got to blitz through Sen. Harry Reid's new memoir this morning in advance of an interview this afternoon and can't do much more blogging until much later, so check back later today for more thoughts on the apparently ongoing and growing feud with Perez Hilton, who lifted a unique phrase from this blog, misused it and refused to provide proper credit. His defense was that his "sources" -- turned out to be an out-of-work Canadian actor named Drew Mullins who is nowhere near Las Vegas but got the material from some Tina Turner list-serv -- sent it to him. Little Mario apparently is so full of himself that he informed R-J scribe Norm Clarke that Norm is "now DEAD" to him for covering this controversy. I have his whole bizarro email to Norm and Norm's permission to publish it, but for the moment just check out the second item in today's Norm column. Sorry to be a tease, but I really can't do this topic justice right at this moment because Reid's tome about the greatness of Searchlight and evil of George W. Bush beckons. My exclusive first-look overview and impressions piece on Cher's new Vegas show, which opened last night, is on USA Today's website this morning. You can find that here. There was plenty of good here, but this show needs a LOT of work. As it was only the first run-through of the production, it is hard to know if Cher and her director-choreographer are planning any radical changes. It clocks in at about two hours and I'm told it'll be closer to 90 when they're done with it. * Drop the knock-off bits from Cirque du Soleil. Like Hans Klok before her, Cher seems not to have done her due diligence in the neighborhood. That two-hunks-balancing-one-another act? Mystere. The aerial sheet-flying thing? Zumanity. When sequences are already done -- and done better -- at neighboring hotels, you wonder if Cher and her peeps bothered to check out the competition. Bette Midler and Toni Basil, by contrast, went and saw every last other Vegas show. Even the ones with animal tricks. Smart. * For the love of GOD, drop the YMCA. Yes, they do this. With Village People impersonators. And no Cher. The whole song, dance and all. Tacky, tacky, tacky. And not in a good, how-'70s way. * You're in the Colosseum, not the MGM Grand Garden Arena. Act like it. This is the most prestigious theater in the Western U.S., not any ol' concert venue. Celine Dion set the standard, being close to but somehow above her audience in a manner that made her seem more elegant, more old-school star-like. Slapping the hands of the audience? Maybe not. Confusing them about whether they can get up and dance? Get with security to work that out. Forcing the crowd to STAND UP AND CHEER FOR FIVE MINUTES FOR AN ENCORE THEY KNOW IS COMING BECAUSE YOU'VE YET TO GET TO YOUR BIGGEST HIT? Insulting. I'll discuss this and have other observations on this week's episode of "The Strip," which will be recorded at home tonight and posted sometime tomorrow. We'll have a podcast, but we can't do the show tonight at LV Rocks because I'm going to cover Cher's opener for USA Today. So no live show, and the dead one will be up on Thursday as usual. Our interview this week is a joint chat with Four Seasons songmaster Bob Gaudio and the actor who portrays him in "Jersey Boys," Erich Bergen. According to this Dow Jones report, Terry Lanni said on a conference call today that the company may someday be split in two, with the hotel operations under one roof and the casino operations under another. There's no timetable and mostly it sounds like frustration about how Wall Street is devaluing the entire company based on some gaming revenue drops. Still, it's an interesting idea because MGM Mirage has long been talking about building non-casino resorts around the world. This could be a first step. * The New York Times: My long feature on the young casino moguls of Vegas, is out front in the Business Section. * Newsweek.Com: My piece examining the recession's impact on Vegas is the top front-screen story. * The Washington Post: My account of Nevada's messy gubernatorial divorce is on page A2. * Agence France Press: My report on the Tropicana's bankruptcy filing is here. "These casinos and resorts provide customers with a high quality casino entertainment and hospitality experience through a comfortable gaming environment, a variety of hotel amenities, casual and fine dining choices, and non gaming entertainment options." "Most recently, Mr. Kocienski was the Chief Financial Officer of the Cosmopolitan Resort & Casino in Las Vegas, Nevada since June 2006, where he was responsible for managing the finance related to the $3.4 billion project budget, transitioning the company from construction phase to operating phase, and evaluating potential acquisitions." Uh, the Cosmopolitan,which is being built between CityCenter and Bellagio, is not transitioning from construction to operation. It's woefully behind on construction and has serious financing problems of its own. Interestingly, Mr. Kocienski worked at Cosmo with ... Scott Butera, the same guy who is now president of Tropicana Entertainment LLC. Butera himself was brought in in March 2008, long after Tropicana's problems were in full bloom, so they're not his fault. But his prior company's not in such terrific shape either. Finally, in case you're wondering if MGM Mirage will snap up the 34-acre Trop and own the entire corner, spokesman Alan Feldman told me: "Although we always evaluate opportunities in our core markets, we have not considered this." Doesn't mean they won't, though. But MGM Mirage is already saddled with enormous debt and tons of real estate, so I imagine it's not likely. Tropicana Entertainment, owner of the Tropicana Las Vegas and Westin Casaurina as well as several other casinos and properties around the nation, has officially filed for bankruptcy. Here is the official release. Click here and you can download the PDF of the court filing, which is fascinating and which I will try to examine right now. Unclear what this means but my impression is there won't be any change in the business operations here in the short-term. Trop Spokesman: Bankruptcy is "Speculation"
The Wall Street Journal is reporting based on two unnamed sources that Tropicana Entertainment is about to file for bankruptcy. Reuters has just moved a piece as well, again using one unnamed source. This may yet turn out to be true and since it's the WSJ I'd say it's awful likely, but I'm the only reporter thus far with an actual comment from the spokesman for Tropicana Entertainment. Friess: Is what the Wall Street Journal reported accurate? Spokesman Hud Englehart: I regard what the Wall Street Journal has reported as speculation. I pressed him from several sides about whether it was true and he wouldn't budge. Tropicana Entertainment owns the Tropicana and Westin in Las Vegas. I understand if you're not interested in this and I know it's not really germane to the focus of this blog, but last night on ABC's "Brothers & Sisters," one of the main characters proposed to the other. It was absolutely groundbreaking. By far and away, it was the most straight-forward, romantic gay scene ever in mainstream entertainment and certainly on network television. Even if you don't watch the show -- and you should, it's a soap opera for "West Wing" fans -- take a look at this. Click above to watch the special VIDEO edition of "The Strip" or right-click here to download it. Over the years, going to Vegas functions has become more of a chore than a pleasure. My partner's dislike of the social scene has spilled over on to me; I'd rather be home with Miles, a movie and my dogs on most occasions. It does become all the same people having all the same chatter, and these things become a minefield for me in which people come up to me expecting to be remembered. I have one of the world's worst memories for faces and names, so it's embarrassing. At the end of the show, there was a tribute to the surviving original Four Seasons, Frankie Valli, Bob Gaudio and Tommy DeVito, as well as their longtime producer, Bob Crewe. You can't really see it that well here, but you can watch the tribute on the SPECIAL VIDEO EDITION of "The Strip" by clicking here or right-clicking here to download it for later viewing. Walking out, I ran into Rita Rudner, who is scheduled to be a guest again on "The Strip" at the end of May once I read her new book. Here she is with her husband, Martin. 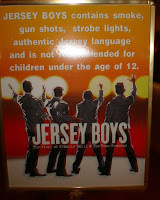 If you can't read it, it says: "Jersey Boys contains smoke, gun shots, strobe lights, authentic Jersey language and is not recommended for children under the age of 12." That takes care of THAT. The room was lined with antique cars adorned by pretty dancing girls in 1950s attire (or vice versa?). There were placards explaining what each car was, but it didn't seem like most people knew they could go up on the platforms and look closer. As always, the food was insane. Little burgers and meatloaf, other odd stuff I couldn't identify. And, finally, there was the Happy Birthday tribute to Frankie Valli. You can see that, too, on the special VIDEO edition. Go see the show. I don't quite agree with Jerry Fink of the Las Vegas Sun, who told me last night he thinks it's the best show in Vegas right now. I think that title might be a toss-up to me these days between Ka, Love and Mamma Mia. But it's certainly quite good.